Restaurant 553: All of Sylva seems to have turned out tonight for cocktails and dinner at Restaurant 553. Diners have laid claim to the umbrella-shaded tables in the lush courtyard where hundreds of dahlias bloom. Well-dressed gentlemen are kicking back on the front porch of the 101-year-old cottage, enjoying microbrews and martinis. 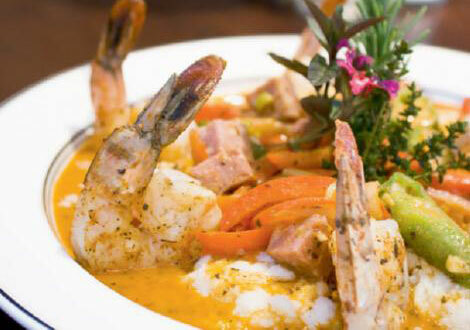 It’s no wonder this is a go-to spot for Lowcountry cuisine and more. Owner and Chef Ross Lorenz, a Sapphire native and graduate of Johnson & Wales University in Charleston, can be seen hustling large trays of entrées to an upstairs dining room one of eight in the former home. In short order, he’s back in the kitchen, whipping up comfort foods like Heinzelmänchen beer-battered crayfish tails served with a spicy mustard rémoulade or escargot in garlic butter. Cool under our umbrella, we tuck into fried Dark Cove chèvre balls drizzled with a balsamic reduction and served over toast and arugula. Made at a nearby dairy, the goat cheese maintains a velvety texture beneath a crunchy exterior, balanced by the tang of the reduction. Two plump crab cakes on a bed of greens are satisfyingly meaty with succulent crab chunks and an appropriate amount of locally milled cornmeal. A generous serving of house-made wild mushroom ravioli is rich for a summer meal with its dense cream sauce, but luscious with essences of garlic, cracked black pepper, and scallions. We balance the buttery dish with an arugula and Romano salad, dressed in a thick sweet-and-sour fig vinaigrette. Toasted almond and honey ice cream provides a cool diversion of sweet, silken texture and crunch, while mixed berry sorbet—both served in martini glasses—cleanses the palate after a fulfilling meal on a summer’s eve.